The Youth Access, Introduction to Conservation and Environmental Education Bridging Programme has been part of the College’s curriculum since 2010 when, with funding from the Hans Hoheisen Charitable Trust (Managed by Nedbank Private Wealth), it was run as a pilot programme. Eight years down the line, 17 July 2018 marked yet another successful graduation where 22 learners, who would not otherwise have the opportunity for further study, completed the six-month bridging programme. Most of the learners invited parents to the graduation programme to witness them graduate. And what a wonderful graduation it turned out to be. 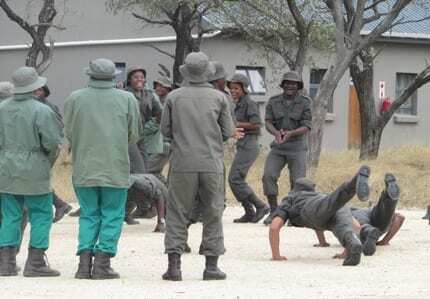 It started out with the passing out parade, where the learners showed their drill prowess at the field ranger base, and was followed by the certification ceremony at the main campus. During the training the following four learning areas are covered: First Aid Level 1, Reptile Orientation, Field Ranger Protected Area and Introduction to Environmental Education. The really exciting part for the students is their deployment and completion of workplace experiential learning during the last two months of the programme. During this phase, the learners get to work in wildlife areas whilst being mentored by dedicated workplace mentors employed by Limpopo’s Department of Economic Development, Environment and Tourism (LEDET). Mentors from Modjadji, Letaba Ranch, Lekgalameetse, Manombe and Turfloop Nature Reserves were behind this year’s successful workplace experiential learning for all 22 learners. The 2018 Programme was no exception to preceding youth access programmes which also produced promising and deserving youth. Noting their achievements was former Youth Access: Bridging Course student Ms Blondie Mabunda who was trained in 2010 as part of the pilot programme funded by the HHCT. 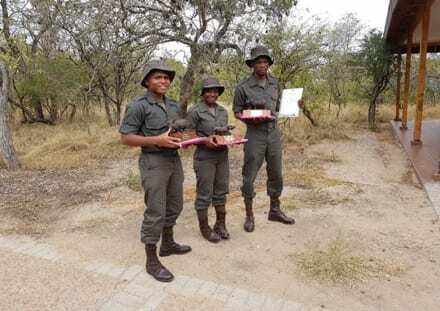 She is currently pursuing a degree programme in Environmental Studies and is employed by Kruger to Canyon where she is mentoring Environmental Monitors. She said that the students should grab every opportunity with both hands as this course was the stepping stone on which she has built her career. The Keynote Speaker, Mr. Solly Themba, Community Facilitator as SANParks’ Kruger National Park, encouraged the students to disassociate themselves from bad company by looking at their “inner circle”. As with Blondie’s speech, he encouraged the graduates to knock on the right doors, to persevere and surround themselves with people that could help improve their lives rather than misguide them. “The College has given you the skills and knowledge. It is now up to you to make use of what you have learnt to go out and make a difference to your own life and the lives of others whilst helping to conserve the environment and our wildlife,” he said. Having attended the graduation, the Timbavati Foundation’s Charles de Villiers and his wife Ingrid said that listening to these students and seeing them graduate boded well for the future and youth of this country. 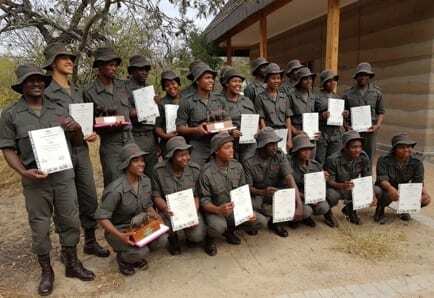 Finally, there was great excitement when the Community Development and Youth Access department, who manages this programme, unveiled the awards for the learners who excelled in the three categories of Best Field Ranger Trainee, Best Environmental Education Learner and Best Learner Overall. This year’s three top achievers were Lidia Sifunda, Luzuko Piko and Siphesihle Qoko respectively. Our sincere thanks is extended to The Hans Hoheisen Charitable Trust (HHCT – Managed by Nedbank Private Wealth), Friends of African Wildlife (FoAW), Timbavati Foundation, Grounded Media, and Children in the Wilderness (CITW) who funded the learners on this year’s programme.